These three areas are part of our mission and we spend the vast majority of our time on them. First, we all pledge to support the Church with our prayers, our presence, our gifts, our service and our witness. We nurture each other and reflect God's love of all people as a Church and as individuals. Secondly we reach out to the people in our community and around the world to help those in need, in whatever way is called for. Thirdly, we gently share our own experiences in knowing God and how He works in our lives with those we meet as we go about our daily lives. In addition to nurturing our own Church family members and friends, we work outside the church to share God's promise. for kids that celebrates harvest time, a Back-to-School Bash that provides school supplies for underprivileged kids, and a variety of other activities. Carpenters for Christ is a group that does home repair and building for residents in the community who cannot otherwise afford to accomplish them. These might include such activities as stabilizing a deck, building a wheelchair ramp, repairing a sidewalk. The group also assists area churches with repair to their facilities and undertakes a portion of Habitat for Humanity projects from time to time. The Food Forum is a group that meets on a monthly basis. This group helps "food challenged" individuals obtain groceries and also provides help and recipes to make nutritious meals. Congregational "Master Chefs" provide provide recipes and instructions for three delicious, nutritious meals, and the participants leave with all the ingredients to create their own meals at home. Special Events for children and adults in the R-C Lake community bring us together and share the Word through music, talks, activities for young people and much more. Among these events are the “Fifth Sunday Sing” concerts, the “Back to School Bash” and Christmas and Easter cantatas. Whether it's an adventure through a “cave” for youngsters or performances by world-renowned musicians or local singers, God's message comes through all that we do! 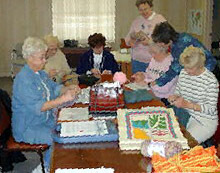 Prayer Shawl Ministry involves the creating of sewn, knitted or crocheted shawls or blankets as a gift of comfort to sick, injured or grieving members of the community. Christian Youth Center, a cooperative project with New Hope Baptist Church, offers regularly scheduled activities for young people in a refurbished building adjacent to Lakeside, including after-school activities, special classes and counseling services. Through the Good Samaritan Program, members of LUMC are able to serve those in need in the south side Richland Chambers Lake communities. It's an important ongoing effort in which the Church helps to provide funds for such things as utility bills, groceries and more. Clothing for Children provides hand-made clothing for children in Mexican villages and other areas. Judy Byerly heads up this ministry, in which she and other LUMC women repurpose donated garments to provide much-needed clothing for youngsters in poor areas of the world. 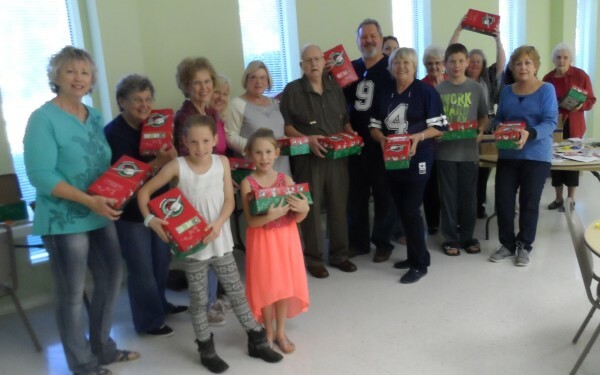 River of Life Food Bank in Fairfield, TX is the recipient of canned goods and dried foods through LUMC's effort to collect those items from our membership each week and during certain special events, such as our Fifth Sunday Sings. Operation Christmas Child boxes are lovingly packed each year and distributed world-wide through the efforts of Samaritan's Purse. Stephen Ministry is a ministry in which trained and supervised lay persons, called Stephen Ministers, provide one-to-one Christian care for individuals facing life challenges or difficulties. They are trained to cover specialized topics such as ministering to the divorced, hospitalized, bereaved, and aging. They are not counselors; they are trained lay care givers. Confidentiality is a cornerstone of the Stephen Ministry. What a care receiver tells his or her Stephen Minister is kept in strictest confidence. At Lakeside Methodist we currently have six fully trained Stephen Ministers. These ministers have been able to help many people through various crises. Anyone who feels the need for a Stephen Minister can contact the church at 903-599-3080 and they will be put in touch with a Stephen Ministry Leader. 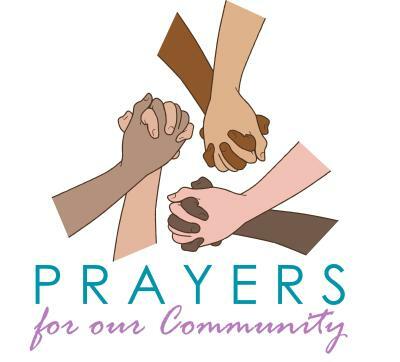 LUMC members are partnering with the Fairfield FUMC to gather together and pray for the Streetman area. We know that there are problems with drug use, alchoholism, domestic violence and other issues at work here in our community. We know that the local governmental structures do not have the budgets and capabilities of dealing with these issues. So what can we do about it? WE CAN PRAY. 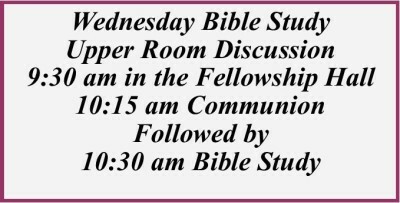 And so each Tuesday at 11 am we meet at the Corley Chapel in Streetman to gather together to pray for our community. Come join us! We believe in the power of prayer, and we want to help our community! 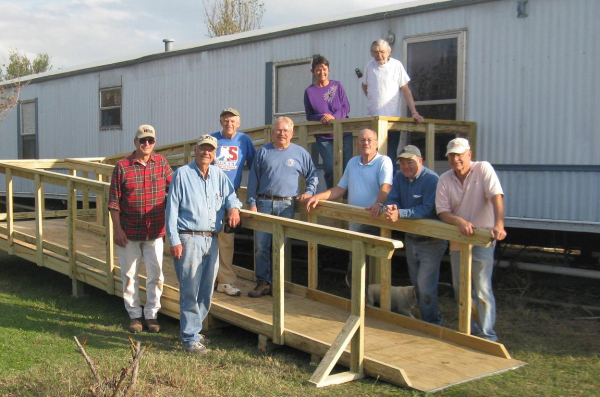 Carpenters for Christ complete another wheelchair ramp for an area resident. A group of LUMC women create prayer shawls for sick, hospitalized or others who need comfort. 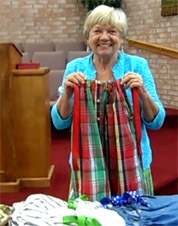 Judy Byerly shares some of the repurposed clothing that she and her group make for children in need around the world. This group of Santa's Helpers packed 100 boxes for Operation Christmas Child on Sunday, November 13th. These boxes of toys and love were then taken to Corsicana, TX and then on to the Distribution Center in Dallas where they will start their world-wide journeys to children all over the world!